2. 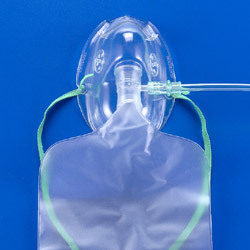 Elongated high concentration mask w / rebreathing bag. 3. Soft, clear and lightweight for patient comfort. 4. Elongated design and visual patient assessment. 5. Adjustable nose clip and elastic head strap assure comfort and safety. 7. Complete with 7 ft. Oxygen tubing. 8. Adaptor swivels to fit patient position.